WTF? ?Man jailed in London for using wife as Maid??? I am sure a lot of wives around the world will see this and think,my husband should be jailed as well. London's Woolwich Crown Court heard that 34 year old Safraz Ahmed, kept his wife, 28 year old Sumara Iram, a prisoner in their home. The courts heard that he verbally and physically abused her after an arranged marriage in Pakistan. She said he also slapped her in the face when she asked him to consummate their marriage. She said one time he threw tins of cat food at her head and another time he covered her face with a cushion. Iram who had a master's degree in Islamic Studies, was not permitted to leave the house alone and took an overdose before eventually calling the emergency services in 2014, the court heard. Ahmed was found guilty of holding a person in domestic servitude, Judge Christopher Hehir told him: "She was bullied and controlled by you, given little money and expected to cook, clean and look after your family as if she was a skivvy. "She described your behaviour as physical and mental torture and in my judgement, she was right." He was sentecnced to 2 years in jail. 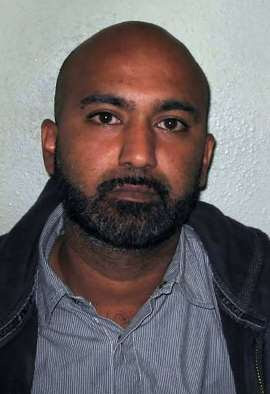 Ahmed became the first in England to be convicted of keeping his wife "in domestic servitude".